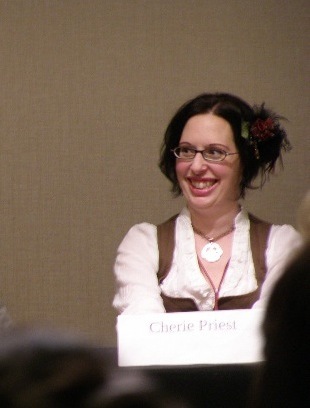 Could I let Steampunk Week go by without a post dedicated to author Cherie Priest? Heavens, no! 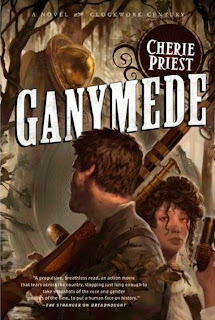 Priest is a marvelously entertaining writer whose Clockwork Century novels combine two of my very favorite things: steampunk and zombies. 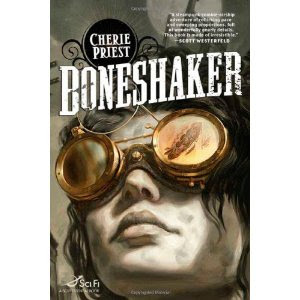 The first book of the series, Boneshaker, won the Locus Award for Best Science Fiction Novel. 2010′s Dreadnought is set in the same universe, as is the short novel Clementine. She also recently released the vampire novel Bloodshot. Priest agreed to answer a few questions, and her responses touch on steampunk conventions, Tim Curry, and the Civil War, among other things. Plus, she offers a peek at her upcoming steampunk novels. Read on! I’m sure you hear this from plenty of fans, but my goodness! You write steampunk, urban fantasy, southern gothic, horror. Is it hard to switch back and forth between the genres? Is there any another genre you’re dying to try? Well, there's plenty of overlap between the genres, really - and almost everything I do has some sort of horror base, regardless of where they wind up being shelved. As for a different genre ... I'm pretty happy over here in the scary-stuff corner, though I've always wanted to write survival horror video games. That's more like a different format than a different genre, I suppose. But still, different! You must get invited to attend so many interesting conventions, such as the recent Nova Albion. Do you enjoy the atmosphere? Ever get inspired by the costumes you see on attendees? Oh God, yes. Nova Albion was great, by the way - and there were scads of fantastic costumes, and likewise amazing vendors with enough fabulousness to bankrupt me in under an hour. Self-restraint is not my sturdiest character trait, so I was constantly on the verge of whipping out my wallet and going to town. But I didn't. I behaved. Mostly. I really do enjoy convention-going, yes - it's always fun to meet readers and hang with other writers for awhile. When you work from home (as a writer, or anything else, I imagine) you spend a lot of time by yourself, so these kinds of get-togethers are good for the soul. In addition to your novels, you have an impressive list of published short stories. Do you prefer writing one length or the other? How do the challenges of a creating a satisfying story change when you’re considering a full-length novel compared to a shorter piece? I don't actually have that many short stories out there; it's not really my specialty, I'm afraid. I get invited to do them on a regular basis...but I suspect I'm not very good at them, so I almost always decline. I'm much more comfortable with longer projects. One of my favorite aspects of your Clockwork Century novels is your alternate take on the Civil War; it’s heartbreaking to imagine that destructive conflict stretching years beyond its actual ending point. The Civil War is also a component in your early books. What is it about that time in America’s history that draws you to it? Well, I'm from the southeast - and I lived there most of my life. Alternate theories of the Civil War are pretty much a regional pastime. When I write, I might as well use it; the war is a very, very rich thing to mine for stories. 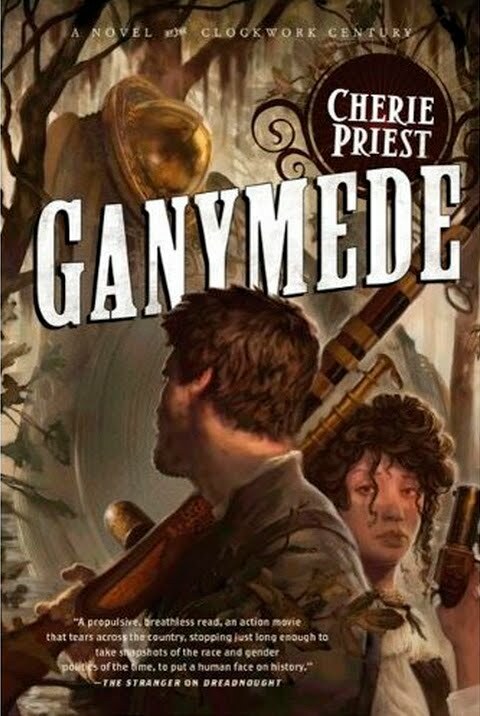 The cover copy for Ganymede, which is due out in September, recently leaked online, and I’m delighted to see that it involves another fantastical machine. How do you come up with your ideas for inventions like the walkers and the Dreadnought? Do you have mechanics or engineers you consult for authenticity, or do you embrace your authorial right to make stuff up? Most of my "fantastical machines" have some basis in reality...so I do my best to learn what I can about the real things before fooling around too much with my authorial right to make stuff up. And sure, I do have a handful of much-better-informed friends who I can hit up for info if I get stuck. I don’t think there was a supporting character in Dreadnought that I wouldn’t want to see featured in a future novel; they were all such fully formed characters on their own. Will we see any more familiar faces in your future books? Absolutely! In fact, you'll see Horatio Korman (the Texas Ranger) turn up in Ganymede; and Mercy Lynch will too, though her role is smaller in the next installment. I also have plans to do a series of novelette/novella vignettes for Clementine's Maria Boyd - I'd like to do a few "case files" based on her time as a Pinkerton agent. And next year's Inexplicables features some of the folks from Boneshaker (in more prominent roles this time). I dearly enjoy recycling characters. Your female characters in the Clockwork Century are all delightfully sane, grounded women. Briar stoically goes about making a life for herself and her son, despite the hostile community around her. And Mercy just rolls with it, doesn’t she? She assesses and helps when she can and never shrieks or wrings her hands or gives in to hysterics. Did you intentionally set out to write characters in your steampunk world that deviate from the tropes of the super-strong supernatural heroines or the too-stupid-to-live heroines who are always sneaking off on their own to confront the villain and then have to be rescued? Oh, I don't know - history is full of intelligent, competent people (men and women alike) ... and I've never been a fan of fiction that requires stupidity to move forward. Dumb protagonists bore me, both as a reader and a writer. But likewise, superhero protagonists who aren't really at any risk of failure ... they aren't very interesting either, unless they're so deeply flawed that their faults threaten to sabotage their success at every turn. I'm much more keen to put sharp, reasonable - but very human - people in difficult, unreasonable situations to see how they handle it. OK, a light question to end things: What’s your favorite book or movie or TV show to relax with? What pop culture items do you use to recharge your batteries? We don't have cable, so my tastes aren't terribly sophisticated from a television standpoint. To unwind, I tend to grab an adult beverage and settle in with America's Funniest Videos or Wipeout - two truly irredeemable shows, I realize. But when I'm tired of thinking hard, well, they're a real relief. My favorite comfort movies tend to involve Tim Curry - Clue, and Rocky Horror Picture Show; I'm likely to throw on either of those while cleaning house or vegging out. Or when I want to watch mid-length fiction done really, really well, I pop in my DVD of the BBC's modern take on Sherlock Holmes. The writing and editing on that show is absolutely killer. 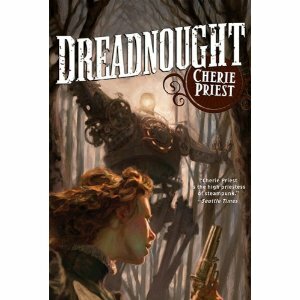 If you're intrigued by the steampunk world Cherie Priest has created and would like to explore it yourself, enter our content for a chance to win her first book! You can find the details here.